Weather: Bishkek was quite hot, but because of the altitude most places ware nice and warm. Lake Issyk Kul you could even swim. In the mountains south of Lake Issyk Kul it is often cloudy in the afternoon and on most days we had some rain there although not extensively. Internet: available in many restaurants in Bishkek. In the rest of the country you are also able to find internet in hotels or restaurants. Creditcards: Are accepted in the larger hotels, supermarkts and restaurants. Fuel we always paid cash. 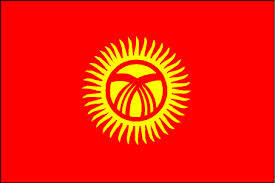 Safety: Kyrgyzstan is very safe. Except for Bishkek we bushcamped every night and had no problems. Camping: We only paid for camping in Bishkek which was $ 11 per night for two persons and a car. All other nights we camped in the wild. Other: We had to pay toll twice and the price for a foreign vehicle is 10 times the price for a local vehicle. No visa was needed for the Dutch. (most nationalities do not need a visa). On entry we just got a stamp that allowed us to stay for 60 days. This period may vary from border to border. Getting the stamp at the border was for free. Be careful however with the customs declaration. The period your car can stay might be shorter than your visa period. The first time we entered there was no custom control so also no limit, but the second time the customs gave us only a 10 days stamp on our custom declaration. For us this was more than enough, but if you want to stay longer you might have to ask for it. Entry: At Kyzyl Art pass (coming Tajikistan). This border is very easy going. On this border we were given no custom declaration and there was also no searching of the car. They only stamped our passports. 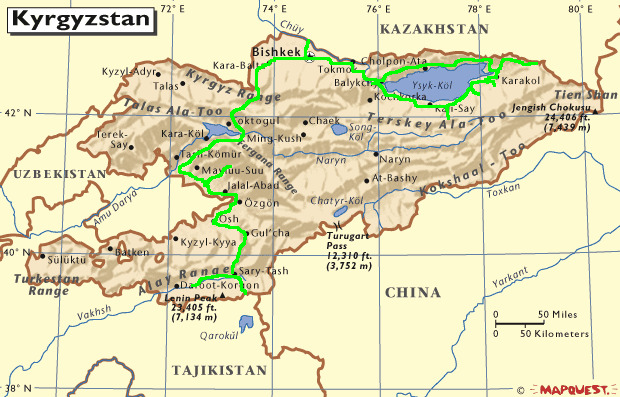 After decending from the pass and leaving the border of Tajikistan it is half an hour drive (30 km) to the borderpost of Kyrgyzstan. As the road was very bad it looked like it took forever but do not worry. When you reach the valley you will see the border. No costs at this border. Transit time just 10 minutes. Exit: At Bishkek (going to Kazakhstan). This border is ofter very crowded. As there was a large que and the only allow a couple of cars in each time we had to wait half an hour before we could enter the border zone. Once there all formalities were very quick. Here nobody asked for the custom declaration form. No costs at this border. Entry & Exit: At Karkara valley (coming from and going to Kazakhstan). We crossed this border twice and all went quite efficient. On this border the do make the custom declaration from and when they make it, be sure to ask for the same periode as your visa. Or at least for the time you whish to stay. Otherwise they might give a shorter period of time. When leaving at this border they ask for this form also. Here they also took a quick look in the car. No costs at this border. From border Tajikistan - to checkpoint on Kyrgyz side: The mountain road decending from the pass is off-road (first 30 km) and can be very bad muddy and slippery when wet. Road to Arslanbob: Not the newest tarmac but OK.
Naryn Canyon: They initially asked for 10 USD. As locals only pay 50 som we refused and in the end paid 5 USD. This was the minimum. There is a rule that they have another rate for foreign vehicles and 10 USD is for a truck and 5 USD for a smaller vehicle. On the way to Bishkek: after Naryn Canyon (coming from Osh) and on the way to Bishkek you have to pay toll a second time. Here the same rule applies as for the Naryn Canyon (see above). We again had to pay 5 USD (or 260 som). Arslandbob: We book a tour at the CBT with a local jeep to see the walnut forrest, panorama and the waterfall. Although not very special we did like the trip. Price 1500 som for the car and drive (we only went with the two of us). Entry to the waterfall is 10 som per person. Issyk Kul: Nice lake where we spent quite some time. In the middle of the summer you can swim in it. As for the landscapes, the south side is more beautiful but here wildcamping on the shore is much harder. On the north side there are many places to camp on the shore. Karakol animal market: every Sunday morning. It starts very early (around 5am) and stops at around 10am so be there on time. The market is a spectacle although it might be hard to see how some animals are treated. Barskoon gorge: Looks like the Alps in summer. We stopped at the waterfall and camped there. Nice spot. The police is corrupt so stick to the rules (do not speed, have your seat belts on and have you lights on) and you will have no trouble. Just give them no reason to stop you. If they do stop you they might try to rip you off. In that case bargain. The stopped us a few times but we paid never more than 500 som and mostly they would also settle for 250 som. It is rule to have you head lights on when driving outside the city and the police is very keen on this. Within the city limits you may turn them off again. This is rule for the whole country. Animal market in Karakol. Starts at 6 in the morning. The stop early. Do not go later than 10 a.m. Camping in the garden of the CBT in Sary Moghul. Nice quiet spot with a great view. Price was 200 som for parking and 50 som per person for shower. Diner and breakfast are available here but expensive. Bushcamp on parking near Solomon's throne in Osh. Parking is guarded but no facilities. Old Russian holiday park and very busy with locals. Old and dirty, but convenient if you want to hike. Very dirty toilets and old showers. Do not go here unless you want to hang out with locals. People are nice. Bushcamp in a small village between Osh and Bishkek. Quiet spot with a nice family next door. We could use their water and got a bucket full with apricots. 250 Som per person and 50 som for parking (fits max. 3 cars). Good shower and toilet, wifi and a outdoor kitchen. A travelers hang out and one of the best overland spots in Central Asia. Nice quiet spot at Lake Issyk Kul surrounded by horses. No facilities. Bushcamp spot at the lake on the south side. Yurt factory in Barskoon. All is handmade. You can visit this place. Was interesting. Teskey Guesthouse in Karakol. They do laundry here. Osh, place where we had our airfilter cleaned with air.